The Spanish sun beamed down on the Andalusian circuit and its 111, 000 spectators, for the third round of the 2013 MotoGP World Championship. It was Saturday’s birthday boy, Jorge Lorenzo who started the race from pole position. After an uneventful start, the field made it safely through into turn one, with Pedrosa who as per, getting the hole shot. His lead was short-lived though, after Lorenzo stuffed it up the inside into turn two, closely followed by Marquez, Rossi and Crutchlow. Rossi took Marquez whilst braking into Lorenzo’s at the end of the first lap. The young spaniard responded next time around into Dry Sac corner, at the end of the back straight with a very tough move on the veteran Italian. By the end of the second lap, the top 5, including Crutchlow, had gapped the persuing satellite Hondas and factory Ducati’s. The following two laps saw crashes from Hernandez, de Puniet, then Iannone and Bradl. All the while, a mistake heading into Dry Sac from Crutchlow, formed a gap between the Tech3 rider and the duo of Rossi and Marquez. Obviously suffering a little bit from his heavy fall yesterday, the Brit failed to make it back onto the tail of the two factory riders. Marquez set a string of fastest laps, which opened a gap between himself and Rossi, whilst closing the margin to Lorenzo and Pedrosa up front. On lap 6, Pedrosa made his move on Lorenzo, after being notified via his pit board that his team mate was rapidly closing in. 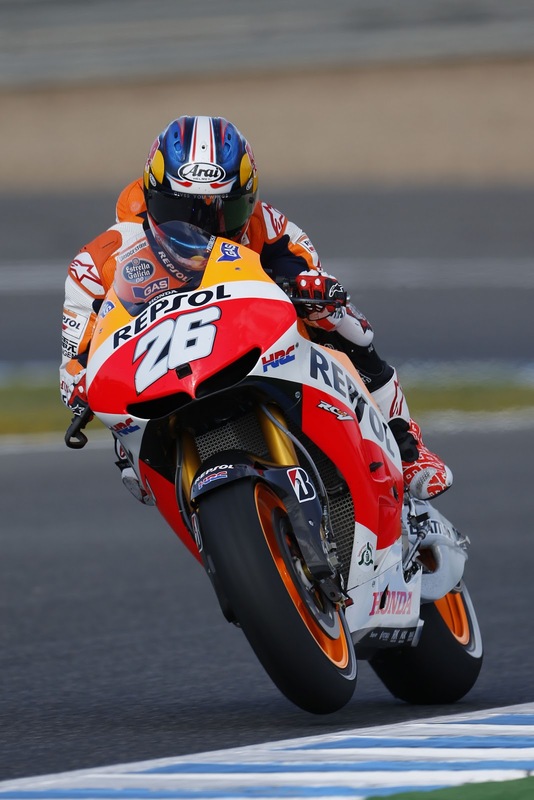 The Repsol Honda rider managed to stay ahead of his compatriot this time around, and soon after began pulling a lead. Marquez caught up with Lorenzo around lap 10, pursuing the 2012 World Champion for several laps, nearly running into the back of him twice at the end of the back straight, on two successive occasions. Lap 12 saw a battle ensue between Bautista and Crutchlow for fifth place, with the pair lying just a second behind Valentino Rossi. In seventh place was a lonely Nicky Hayden, followed distantly by the quartet of Dovi, Espargaró on the CRT, Pirro on the new spec Desmo, and Bradley Smith in 11th. With 11 laps to go, it looked like Marquez had given up the ghost on catching Lorenzo, with larger gaps forming between the top 4 riders. This theory was deemed to be false a lap later, as Marquez began to chase down Lorenzo once again, closing every lap by a tenth of a second. Meanwhile, Crutchlow and Bautista had a near collision going into the Dry Sac corner again, with Crutchlow coming out ahead, still in 5th place. A few laps later and another rider binning it, in the form of Czech rookie, Lukas Pezek; the duo of Espargaró and Dovizioso pulled away from Pirro’s laboratory Desmosedici, forming a battle of their own for 8th place. Dovi struggled to get back past the CRT rider, but managed to do so a lap later, utilising the extra horsepower in his Ducati. With 5 laps to go and Marquez finally clawing onto the back of Lorenzo’s M1, the pair began to close down Dani Pedrosa, taking large chunks out of his lead. Although, it was all a bit late, as Pedrosa had already checked out of the circuit, heading into hyperspace. The race was his. Despite looking as though he was struggling to keep up, Marquez remained sufficiently close behind Lorenzo going into the last lap, in order for another classic Jerez-last-lap-dash to occur. The rookie made a preliminary move down the back straight, under braking into Dry Sac, but ran it wide, allowing Lorenzo to regain his position. Luckily for Marquez the gap was still manageable and allowed him to prepare for a final lunge into the final corner, the newly branded Lorenzo’s corner. He pounced. Literally. An overtake nearly identical to that of Rossi’s on Gibernau back in that oh-so-famous Grand Prix in 2005. Equally as tough, equally as controversial. Lorenzo did not run his Yamaha into the gravel trap, and made it home in 3rd place, but he was livid. After shaking his head all the way round the cooling down lap, Lorenzo was still visibly angry in Parc Fermé, refusing to shake the hand of his compatriot, Marquez; instead, giving him the highly authoritative ‘finger-wag’. What occurs after this race, in terms of action taken by Lorenzo, Marquez, and Race Direction, will of course be reported here as soon as we hear anything.